The night train was taking me from Istanbul to Çumra. A soft breeze was blowing through the blue curtains of my single sleeper; a small unpretentious but well designed unit with all the basic commodities. I drew the curtains to see the landscape; a clean and well-ploughed earth alongside a continuous horizon line could be seen from the window of the train. I wondered if I would see any burials. Back in Istanbul, during lunch, my Kurdish friend had proudly showed me a pictured of the family graves he had built. A small square construction painted in blue where a few months ago his stillborn child had been buried. Next to it a large unit covered the remains of his parents. The struggle of being Kurdish in a no man’s land probably killed them rather than old age. The train stopped at Çumra and the conductor helped me with my very heavy luggage. I had to jump from the train as it stopped on the wrong side of the station and there was no platform. I walked along the railway tracks towards the small building painted yellow on which the name of Çumra was written in blue. A very young Muslim woman wearing a hijab sat on the floor on a small carpet feeding strawberries to her children. She was also waiting for her pick up, who arrived minutes before mine. I took a picture of her and her two little girls. Although she was not able to read the sentences I was pointing at in my language survival phrase book, she responded with friendliness and complicity to my 10 words of Turkish. She asked me if I had kids, and looked at me sadly when I responded negatively. The place smelled of scarcity but was full of pride. Two traditionally dressed women and two overconfident looking men wearing sunglasses and walking as if they were marching came towards us. They looked at the women as if they were aliens from another planet. The older man addressed himself to them as if they were a regiment that he had to order and discipline. The younger one looked at them the same way that children look at the unknown with a softness that the West has erased from the male’s face since many decades ago. A mixture of fear and excitement accompanied me until I recognized the pick up that would drive me to the field station.When I first crossed the threshold of Catalhöyük I felt as if I was entering a different dimension; a place which was going to change me. During summer 2007, I was the artist in residency; I had a desk at the laboratory, a laptop and tons of database to go through.I had two objectives in mind. The first was to acquire visual material for my studio project in London; the project consisting in a series of paintings and plaster tablets. The subject matter is inspired by my experience at the Turkish Neolithic city. To do that I would respond to images produced by light and shadow, colour and of course the flatness of Catalhöyük’s landscape. I would also try to produce mud figurines in the most spontaneous and handcrafted possible way since I had no experience in the use of the media. Finally I would listen to the place. My second objective was to collect haematites and soil to extract pigments and produce colours as similar as possible to those used by the prehistoric people to decorate their homes. With the help of the experts I would experiment with them in the laboratory and hopefully be able to return to London with enough material and information to produce my owncolours. To achieve the first objective I placed myself in the Experimental House. Initially I was inside the building, then on the roof and finally I walked around it. I drew, photographed, filmed and made notes about what I saw, what I felt and what I thought. The situation could not be more artificial as tourists kept on coming inside the EH (Experimental House) disturbing my privacy, silence. On one occasion, while I wasn’t there, they helped themselves to my set-up camera and took snap shots of the family; thus ruining a whole day’s work. I could hear the guards outside chatting in Turkish and the familiar sound of a radio coming from the small kiosk across the road. However, all these disturbances were a blessing: after all when Catalhöyük was thriving with people they would have been walking on the roofs, making fires or exchanging goods; an activity probably comparable to the one in my surroundings. The sound of mopeds and motorbikes as well as cars and lorries passing by the road, merged with the sometimes strong noise of the wind, the tunes of the birds and the occasional bark of a dog. · The discovery of a sun clock which explained why the people of Catalhöyük would build the entrance to their homes on the South East corner of the roof. .The running of the small oven placed underneath the ladder that gave entrance to the house. Previous attempts had been unsuccessful. · Manufacture of sun-dried figurines using local mud, water, urine and straw. Recompilation of images from light and shadow created by trees, people or the figurines I manufactured. Recompilations of coloured plaster samples to use as pigments. The experimentation was done in the laboratory with the help of the experts. I collected a bucket of plaster lumps; I crashed them and sieved it to obtain powder. This was send to London to make plaster tablets. It was very enlightening for me to observe and listen to the scientists; an eye opening experience that gave me an introductory acquaintance to archaeology. It appears to me that the scientific mind has a linear methodology of observation and often in its journey it travels loaded with tons of microscopic database information. Although essential, at times, this process can be a burden that often shades a wider focus of observation which is what the artist uses. From the above I have made five DVDs which together with these notes present an account of the outcome of my residency in Catalhöyük. Further work has evolved from it and it is being carried out in my London studio and will be exhibited in a gallery at a future date. The studio work will be used as the practical part of my PhD titled “Levantine rock art versus the wall paintings of Catalhöyük; Interpreting prehistoric images from a Modern painting perspective”. Aim 1. To work from a dozen of items (2D and 3D) excavated by members of the team present in the site and to question them to obtain views and a response to the possible meaning of the items. Most artefacts found by the archaeologists had already been transferred to either Konya or Ankara and I only had photographs to work from. A series of small figurines (Goddesses) were bought to the laboratory on my last day in Catalhöyük. No comments were made on those. Aim 2. Use materials available around Catalhöyük, pigments taken from Turkish haematites; trying as much as possible to use what was used for the originals. Lime or whatever plaster or plasters were used. I will improvise tools, brushes and experiment with the mud and clay. Chris Doherty had not yet seen the frescos at Ankara or Konya. He did not know the exact colours of the pigments. He has not found haematites in Catalhöyük. Next year he will endeavour to complete a research to decide on the type of plaster used in the walls of the houses. At the moment it is not known. There is no stone in Catalhöyük. Plaster is used instead. The existing plaster has several tones of white. He mentioned the fact that the interiors would often be covered in smoke and therefore the colours on the wall paintings would have been affected by it. So far three colours have been recorded; red, white and black. In James Meellart’s records and copies of the frescoes he found there is evidence of blue, purple and yellow. The Chemistry Dept of the Konya University provided me with the name of a company in Ankara where to obtain haematites. They said that their pigments came mainly from Bayer in Germany. As far as they knew none of the source haematites were Turkish. The same information was obtain from a dozen shops that sold paint in Konya and Istanbul. Füsun Ertu? passed information to me regarding the use of dyes extracted from existing plants around the field station and other plant sources. See video No. “Talking to Arik Marciniak /Spirals – Talking to Füsun Ertu?/Materials” above. I conducted experiments with rubia peregrina, commonly known as “paint plant” obtaining a very beautiful dark red. I applied the red to the plaster and the result was a colour very similar to the original painting-sample in the laboratory. Further research was carried out in London and will be discussed in the second part of this paper. The final result was a very soft colour that will probably fade away easily with time. None of those colours were found on the walls. It is also important to mention that the frescoes would often be covered with a coat of thin plaster as a means of protecting them, or to hide them (?) or to paint on top of them. 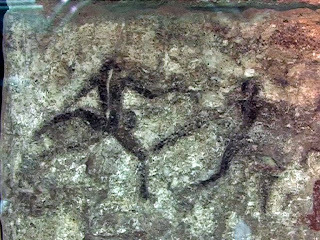 In Paleolithic times the images would be drawn on top of images but in the Neolithic this does not seem to be the case. From my visits to Konya I gathered a selection of pigments from local shops; the shopkeepers seemed to agree that the products came mostly from Germany. Later I bought more pigments in Istanbul where I was told the same information. After spending two days insight the experimental house observing the light pattern created by the sun light against the Southern, Western and Eastern walls I noticed a sun-clock. See DVD No. 4 “The Sun clock – Light and dust. A beam of light entered the EH crossing through the wooden ladder and creating a shape on the West wall. The semicircular movement created by this image that slowly became a rectangular shape reflecting the rung of the ladder, would start from the centre of the West wall and would disappear at about 40 cms from the ceiling of the East wall. The angle of the diagonal beam of light entering the units would vary slightly from house to house and because of the Earth’s movement the pattern would also travel from left to right giving an exact record of the time of the day as well as the Season. Beside the functional purposes of the Sun clock I observed that at about 16.30 on July 17th (the degrees of the diagonal of the beam of light obviously change daily) the sun projected a perfect screen on the East wall that remained there long enough to perform projections; shadows could be produced either by using hands, objects or the figurines I had made. This demonstrated that our 9000 year old ancestors had the facility of projection; what could be called prehistoric cinema. Then using old card board and the broken sacks of polyester from the bins I made cut outs of figures and animals. I assume that the sharp edge of the local obsidian stone did provide the Catal people with very efficient cutting tools. Similar cut outs could have been made using the left over of dry skin, soft wood, twigs or leaves. A small video titled “Shadowhoyuk” was also produced in collaboration with archaeologists Ruth Tringham and Steve Mills. Because of my Catholic upbringing when I started to edit the footage from the EH I kept on hearing in the back of my mind Maria Callas singing Bach’s “Ave Maria”. Of course my associations have nothing to do with the belief or response that the people of Anatolia would have had. However, what seems certain is that there was an emotional outcome generated by the beauty of the wonderful beam of light entering their lodgings. An outcome loaded from whatever belief the town people shared. I was made aware by the team that most life in Catal took place on the roofs and outside. It is also important to mention that work in the field station is only carried out during July and August and therefore there is little data on how does the place look during Spring, Autumn and Winter. I would be very interested to further my research during those seasons. Perhaps 70% of my time in Catalhöyük I spent inside the EH and walking on its roof. During the periods when the place was not frequented by tourists I tried to create a more accurate atmosphere, by blocking the South entrance with the help of a mattress and a sheet of white cotton (such entrance was made to facilitate access for visitors to the EH). In this way, I could experience the interior as it might have been 9000 years ago. I feared that after a while I would feel a sense of claustrophobia as the unit was not very large (measurements). Interestingly, the hole on the roof and its aperture to the blue sky provided my eye with the certainty that the exit was continuously available counteracting any phobia. The proportions of the room were also important. How were they calculated? I assume that the body could have been used as a tape measure (foot steps; width of the hand, the length of a stick? However the important issue is the actual proportion. Where did it come from? Was there a relationship to the reflections and cycle of the Sun or the Moon? Another important question was the positioning of the frescoes. 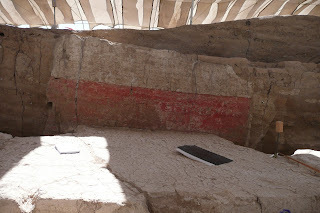 The red wall that had been unburied in the East mount is an example (Fig.2 and 3). The positioning of the design confirms what James Mellaart said to me back in 2004 when I was first acquainted with the Neolithic city. Fig 4 also illustrates the positioning of the painting known as “The Volcano”. According to Mellaart the majority of the frescoes he unearthed were place from the horizon line down to the floor. A very different concept from Museum hanging; paintings are there to be seen by the viewer standing in front of them. Perhaps the inhabitants of the decorated homes preferred to enjoy the images seated down. Either by the fire, or while eating, playing or lying down in bed while the sun or a burning light would cast shadows on them. Also their buried relatives would be close to the images, creating perhaps a strong link between the living and the dead. Figuration versus abstraction brings another issue. The abstraction of a pattern can always be traced back to nature. As Picasso once said –there is no abstraction- It is possible to imagine the endless amounts of symbolism that such images could provide (Fig. 4). With figuration the narrative is the first interpretation and one would believe that if we were looking at the image of two people in movement (Fig. 5) the reading would be limited to a dance a ritual or an action that we would have to relate to the narrative of the rest of the images in the same panel. On the 31st of July at 00.48am there was a full moon. I wanted to live the experience from inside the EH.I retired there at half past eleven. I blocked the entrance in the south wall to create an environment similar to as it would have been in Neolithic times. I sat on the ladder looking up. The night was clean and the sky clear and packed full of stars. At times it resembled a massive silky royal purple mantle where some Anatolian weaver had carefully placed millions of shinny minute diamonds. Owls would sing their songs with the same precise timing with which the faded sound of the call for prayer could be heard from Küçükköy, the village North from us at about one mile and a half. The clarity of the sky made it very easy to follow the sequence of the stars, the Milky Way, Venus; etc…Whatever name the Anatolians used to refer to them it must have given them a clear reading to register Luna counts, seasons and any information important for a broadcast. During the night I thought I was hearing sounds coming from underneath the floor. It had been plastered to represent the area inside the house where the dead would have been buried. It was obviously a trick of the imagination, but interesting. I woke up with the sensation of having my lungs full of plaster. This problem might have been solved by placing layers of fabric e.g. a carpet like covering all over the floor. In this way the dust would not be inhaled during sleep. From my trips around the place I filmed a large amount of shadow-images created by the sun reflecting on to objects. I trust that nothing would have escaped the observing eye of the Neolithic artist. I recorded shadows from trees, leaves, flowers, animals and from the EH. See DVD titled No. 2 “Figurines – Shadows – Making the oven work” The same information that populated my mind, almost exactly as I was seeing it was available 9000 years ago. Considering that the town was built east of a flowing river on those days, the variety of shadows must have been even greater. Let alone the images from the huge variety of fauna and flora that the moist and the water would have produced. The spirals (Fig. 6) were found around the walls of a ditch that formed a small space, a rectangle of 190 cms on the Western & eastern walls and 105 cms on the Northern & south walls. It was unburied by the Polish team. The plaster is a strip about 30 cms wide and it goes all the way across the ditch horizontally covering the South, West and North walls. There is no design on the East wall. It is placed at about 40 cms from the present floor where a burial was found. The removal of the human remains and further digging would not take place until next year when the Polish team would return. Meanwhile to protect it, it would be buried again with gravel. Ian suggested that I should make a drawing of it. I have never been very good at making complete drawings of interiors, let alone a ditch that to be seen as a whole it had to be viewed from above, thus from an awkward perspective. However, the design on the strip was so appealing that I wanted to have a go at it. At the same time, Duygu, helped by Philip, was planning to make a paper cast of the surface. Special blotting paper had been ordered from Ankara for this purpose. We started early in the morning before the Turkish sun was high in the sky. Duygu and Philip sat inside the ditch experimenting with the paper, carefully cutting it into strips. The day before, they had consolidated the surface by filling in the cracks with Primal and grout, to make sure that the design was secured. I sat above the ditch positioning my feet between two stones to be able to return to the near exact position the following day. The angle was steep and the design was not at a straight angle either. Therefore the combination of steep diagonals together with my vision started to create a drawing totally distorted —-I was seeing the design with my contact lenses and I was drawing it through my reading glasses—. I thought of using the bright shape made by a beam of light which was filtering between the canvases of the Marquee. It had been placed there hanging from the ceiling to protect the site. The shadow moved far too fast for the speed of my drawing and after having spent a total of about 4 hours on the drawing I gave it up. I then moved myself down to the ditch were Duygu and Philip were busy covering the entire surface with the paper stripes and water. There was little time left to respond to the spiral designs. They would soon be covered with a sort of papier-mâché and left to process and to dry so that an exact cast of the original could be made. Time was running out. I sat between the experts and stripes of white paper dirtied by the dusty reddish soil that came with the wind. The spirals were probably drawn in seconds and with great conviction. To achieve such symmetry with the use of curves is extremely difficult. The whole pattern was probably done from left to right, if the artist was right handed, and all in one go. An enormous amount of concentration is needed to draw such images accurately. Maria Gimbutas claims that the Goddess as Energy and Unfolding has symbols that –quote—“moving up, down, or in a circle, they symbolize cyclical time. The pulse of life demands an unending stream of vital energy to keep it going” (Gimbutas Language 277). Needless to say that the symbolic meaning of the spiral has been and still is the subject of many books and continues to do so but for me, as an image maker, the importance was not in the meaning but in the making. It is possible that an Anatolian designer was commissioned to draw the spirals in the same way that I was. There is little doubt that they were chosen deliberately. But was it the choice of the maker or the choice of the family of the deceased? Or was it simply the local tradition for burials? However, by drawing them I was trying to understand how they were made. Some sort of reversed automatism was taking place. Automatic drawing was developed by the surrealists as a means of expressing the subconscious. Having worked in this manner for several years I was now reversing the process by allowing a free flow of images fed by the spirals in front of me. They kept on passing by my mind in an animated manner. I focused on a black spot that read to me as a snake’s eye. I drew from there. The marks of my 2B pencil were too soft for the edges of the spirals; probably a charcoal stick would reproduce better the spiky edge of the relief travelling across the surface making the waves. I had none. What did the spiral-maker use? A finger? A twig? A bone? How many times did the artist wipe the wall cleaned, removed the plaster and applied it again to the fresh surface? It was difficult to know. Meanwhile, I continued to focus in the piton looking at me. Beige and grey in a totally uneven surface and precise curves waving up and down with complete certainty. Having been buried for 9000 years the stripe of spirals began to change colour as it was exposed to the air. The heat of the bitter sun had also an impact on it and a shrinking process started to take place. The conservation expert applied all her expertise to slow down the process to a maximum, yet a year would go by before the whole design was cut out from the wall, fixed on a support and taken to the Konya Museum where it would eventually be seen by the public. The following day, we returned to the place early in the morning. The spirals were all dressed in white, like a bride’s gown. Duygu was now alone. Philip had already returned to London and she had to complete the job without help. Onthe third day, early in the morning, I went up the mount, hoping to try and draw the spirals again. I knew Duygy had already removed the papier-mâché and I was aiming at being able to draw the spirals for a couple of hours or so. I sat facing the piton and tried as carefully as I could to draw the shapes and the sharp indentations with my 2B pencil. Alas, the charcoal bits I found by the fire, were far too small to handle to allow me to draw with them. Time was flying and soon, a group or workers arrived. I could not understand what they were saying but I gathered they came to cover the spirals with Geo textile, a synthetic material and then bags of gravel. I pretended that I did not know and I continued drawing the piton and the spiral next to it. Duygu arrived then and politely asked me to move. Back at my desk I inspected the sketches I had made. I did fail completely in terms of portraying the plaster designs but I learned that there was a sophisticated mind behind the spiral maker. There was a 9000 year gap between us but for a few hours we shared the same process, we had to deal with similar problems and above all we were both trying to produce an object that would mean something to the community. With the help of Hilal Gultekin who acted as a translator for me, I visited the neighbouring town of Küçükköy where we were invited for tea at the house of a couple who worked in the field station. Outside in their garden they had built two ovens, (Fig 7) a small one for regular use and a bigger one to cook larger amounts of food probably to sell. They explained that they bake bread by sticking the raw dough onto the interior walls of the oven until it was cooked. The ovens were fuelled with dry dung and depending from which animal it came from it woull burn quicker or slower; goat’s dung burns easy, cow dung burns slowly. Maybe a similar fuel was used in the ovens of Catalhöyük. The manure gets shaped into circles that are then placed to dry under the sun. The small oven had its aperture to one side but the bigger oven had it on top. There was also a small aperture at a couple of centimetres from the ground for ventilation. Seen from a distance the small oven resembled one of the classical Catalhöyük Goddess’ shapes. The oven inside the EH had been built according to the size and characteristics of the remains of the ovens previously excavated. No oven has yet been found with the complete top and therefore the replica is an approximation to the real thing. Attempts to make the oven work had taken place previously with no success as the unit would get covered in smoke and the fire had to be put down. I thought of having a go at trying to light it. While at the laboratory observing Duygu gluing together the various prehistoric pots, I noticed that often the ceramic was totally burnt. The insight of the pots was as burnt as the outside. From this image I started to imagine a situation where a young child was running from roof to roof of the houses carrying embers to feed the ovens of the interiors. I then made a fire outside; with the heat and the dry wood available it was set alight in minutes. I then burnt a considerable amount of wood to produce a generous amount of embers. Previous to that I had collected a sack of charcoal from the fire that the team would religiously make every Thursday evening. I filled in the oven with about 20 centimetres of charcoal. I then collected a bucket of embers from my new fire and I placed them on top of the charcoal. I used a piece of cardboard to fan the fire. To keep it going it did require fanning at regular intervals. I kept the oven going for over two hours. I believe that the oven apertures, both on top and to the side would have to be modified by trial and error. A shorter aperture or maybe a design like the large oven of the family in Küçükköy would probably improve its performance. Since my return to London I have carried out several experiments with plaster, plant- pigments and iron oxide. The colours and textures that resulted from these experiments can be seen in: See DVD titled No. 3 “Drawings/Catalhöyük-Work/London”. (This youtube is placed at (5) above. Back in Catalhöyük and by chance I noticed the binding qualities of chickpeas. Crashed and mixed with water they provide a good media that adheres easily to plaster or paper. My first attempts at making tablets failed because the plaster would crack when drying. By adding rabbit skin glue or gelatine the consistency is adequate and it does not crack. Both ingredients could have been extracted originally from animal skin or boiled bones. Further research is being carried out at present and the results will be published at a later date in conjunction with my PhD research. Since the birth of Cubism at the beginning of the twentieth century, painting has slowly branched out into very many different Medias, many of which no longer require paint or a flat surface. The possibilities that such variety offers cannot be argued and its development advances inevitably hand in hand with technology. The benefits that progress brings to our society are undeniable. Furthermore the concepts of Post modernism expand at a speed that could be compared to Windows Operating System. However, in my opinion the act of mark making is something innate to humanity and cannot be erased. For years I have used Palaeolithic and Neolithic paintings as reference for my work. After visiting Catalhöyük I am convinced that it is crucial for painters to return to the origins of pictorial human expression and revisit it from where we stand now. The endless technological possibilities available to the modern artist can perhaps help us to come closer to the aims and meanings of the paintings and artefacts made by the prehistoric artist. The further away that modernity takes us from the Palaeolithic and Neolithic Hommo Sapiens the closer that the work of the artist becomes to that of his/her creative ancestors. To my way of thinking, the umbilical cord that tightens the images together through time can only be cut loose by revisiting prehistoric painting from a new concept of space. There is a considerable difference between a rock or plaster surface and the sophisticated qualities of wood, silk, canvas or paper. The same goes with the use of blood, excrement, iron oxide or plant pigments and the expensive tubes and pots of paint available today but the hand writing of every human being has kept its uniqueness and will never change. I propose a research to study compare and interpret the Neolithic and Chalcolithic images on the interior walls of Çatalhöyük and those in the Levantine rock shelters in the East coast of Spain. My aim is to offer a new theory to the reading of prehistoric paintings via the ethics of Modern Painting. The purpose of my Phd will be to provide a new perspective in the reading of the images of ‘Levantine” Art and of Çatalhöyük generating therefore new paths of research. My most sincere thanks to James and Arlette for their help and encouradgement. Tag Bristol -17/12/2010 Is there more to prehistoric Art than archaeology? Grant Cox, 3D Artist/Archaeologist, "Informed Archaeological Visualisation"